Help Ahjazda prepare for the storm. The Ring of Desiccation can easily be stolen from the Museum of Oddities. Speak to Ahjazda about the "Coming Storm". Steal the Ring of Desiccation from the Museum of Oddities. Get the Calming Pants from Fimmion. Get the Amulet of Disintegration from Milchar. Ahjazda, the owner of Things Found asks you to retrieve three items for her so that she may prepare for "The Coming Storm". The three items she needs are as follows: the Ring of Desiccation, the Calming Pants, and the Amulet of Disintegration. The Ring of Desiccation is located in the Museum of Oddities in Crucible. It is in a locked display case on the second level of the building; if you ask Una Armina for a tour of the museum, she will show you the exact location. Due to a bug you can take the ring from right in front of her eyes and she will not care. If you speak to the beggar, Fimmion, about the Calming Pants, he will request a sweetroll. You can trade a sweetroll for the pants. You can also kill him and take the pants from his body. If you'd prefer the non-violent option, one source of sweetrolls in Shivering Isles is in Rendil Drarara's kitchen. But don't give Fimmion more than one sweetroll, as he will give you a number of pants. You will not be able to turn them in because you have more than one. The Amulet of Disintegration is located in the ruins of Milchar, located in the northwestern section of Mania. Locate the entrance to Milchar, Tieras, make your way to Milchar, Chatterhall and you will find a room containing a chest and a Ritual Torch. If you try to pick up the torch you will receive a message saying it "can be held by any but owned by none". If you use the grab key, you can move the torch without adding it into your inventory. Using a Telekinesis spell may also improve your grip. Use the torch to light the three podiums in the room. Be aware that the podium fires will extinguish after a few seconds, so you will have to be quick in lighting all the fires. When all podiums are lit at once, you will be able to open the Diligence Crux in the middle of the room. This urn holds the amulet. Return to Ahjazda with your items. In return she will teach you the Greater Power "Ahjazda's Paranoia" which is Frenzy up to level 25 in 50 ft for 10sec on Touch. Since the Ring of Desiccation is originally part of the Museum of Oddities, you can actually buy the ring back from Ahjazda then donate it back to the Museum. If you ever want to get the items back you will be able to buy them back if your Mercantile skill is fifty or more. If it isn't then you can either pickpocket them or kill her to get the items back. If you put on the Amulet of Disintegration then you will have a permanent flame effect that can also help to train your armorer skill. If you give Fimmion two sweetrolls at the same time (one for this quest and one for the quest Falling Awake), he may not give you the Calming Pants. If you give him three sweetrolls, you might receive two pairs of the pants. Unfortunately, Ahjazda will not accept either pair and you will not be able to complete the quest. The Console code SetQuestObject 00078727 0 will allow you to drop one pair and finish the quest using the other. Fimmion gives you the Calming Pants but the same dialog comes back up like you never got them and he gives you another pair. This bug is fixed by version 1.0.0 of the Unofficial Shivering Isles Patch. 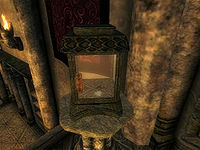 The Milchar, Chatterhall torches around the urn will already be lit due to a bug so it makes it appear that lighting the braziers won't make any difference, but it should work anyway if the braziers are lit quickly enough. You can bypass any problems with this section of the quest by using the Console to add the Amulet of Disintegration to their inventory with this command: player.additem 0007872e 1. There is a chance that you cannot start or finish the quest. The reason for that is when Ahjazda leaves her shop she will leave from the top floor door. This will cause her to jump off the balcony, which causes a major health loss for her. The Ring of Desiccation may be permanently missing from its display case. This may occur if you previously stole the ring and then gave it back to Una Armina. In this case, a bug described in the "Bugs" section of the Museum of Oddities page can cause the ring to become permanently stuck in Una's inventory. You can pickpocket or kill Una to retrieve (killing her will terminate the Museum of Oddities quest though). Equipping the Calming Pants will add an active effect under your spells menu called "Extreme Calm"—the only effect of this is to add the visual effects of Calm spell. If the pants are equipped before initiating dialogue with Ahjazda and giving them away, the effect is not removed. 10 Ahjazda believes the world is ending soon, so she's gathering supplies. She would like me to find three items she's still missing: the Amulet of Disintegration, the Ring of Desiccation, and the Calming Pants. 20 I've found the Calming Pants. 30 I've found the Amulet of Disintegration. 40 I've found the Ring of Desiccation. 50 I've brought Ahjazda the Calming Pants. 60 I've brought Ahjazda the Amulet of Disintegration. 70 I've brought Ahjazda the Ring of Desiccation. 80 I've found the last of the items that Ahjazda requires. I should return them to her. 200 Finishes quest Ahjazda has rewarded me for bringing her all the items she requested. 201 Finishes quest Ahjazda is dead and will no longer need the items she requested I find. It is possible to use the console to advance through the quest by entering setstage SE44 stage, where stage is the number of the stage you wish to complete. It is not possible to un-complete (i.e. go back) quest stages. See SetStage for more information.